“Unless humanity learns a great deal more about global biodiversity, and moves quickly to protect it, we will soon lose most of the species composing life on Earth. Remember when your family went on a long automobile ride and your car’s windshield would become coated with bugs? Stopping at the gas station was not just about getting fuel, it was also about scraping off the window so that you could see. That doesn’t happen much anymore. That doesn’t happen because those insects are going extinct. There are signs of hope amidst this crisis. The continued discovery of new species. A coral reef recovering. The resilience of an individual species surrounded by human encroachment. Mikanowski highlights the fluctuating plight of the Lange’s metalmark butterfly as one example. 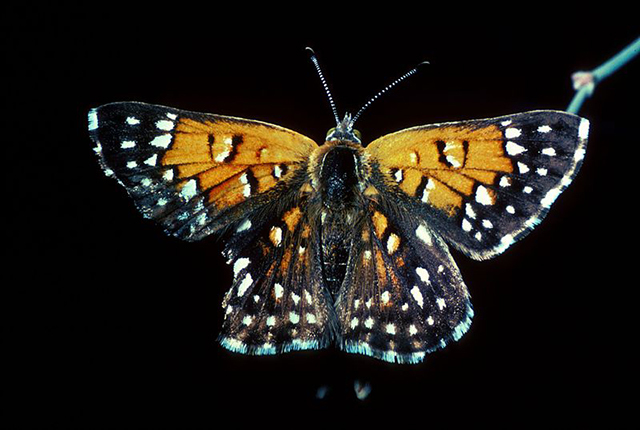 The tiny brown and orange butterfly with white spots feeds on a single plant that is being choked out by weeds, threatening the metalmark with extinction. The US Fish and Wildlife Service is taking bold steps to suffocate these weeds and allow native plants to return, and with it the health of the metalmark. “If we can bring back the environment, we can bring back the butterfly,” says wildlife refuge manager Don Brubaker. As E.O. Wilson says in his book Half-Earth: Our Planet’s Fight for Life, “The crucial factor in the life and death of species is that amount of suitable habitat left to them.” If we can protect sufficient habitat – the habitat that butterflies and other species call home – we can protect the bulk of biodiversity. This is the premise for E.O. Wilson’s call to protect Half-Earth. If we protect half our lands and seas we have the opportunity to reverse the extinction crisis. We must do more. As E.O. Wilson says, “The only hope for the species still living is a human effort commensurate with the magnitude of the problem.” Half-Earth offers that inspiring solution, raising our ambition to a new level, and the Half-Earth Project is engaging the public and convening the conservation community to achieve this important goal. To learn more about the Half-Earth Project visit half-earthproject.org. Read the full article by Jacob Mikanowski.